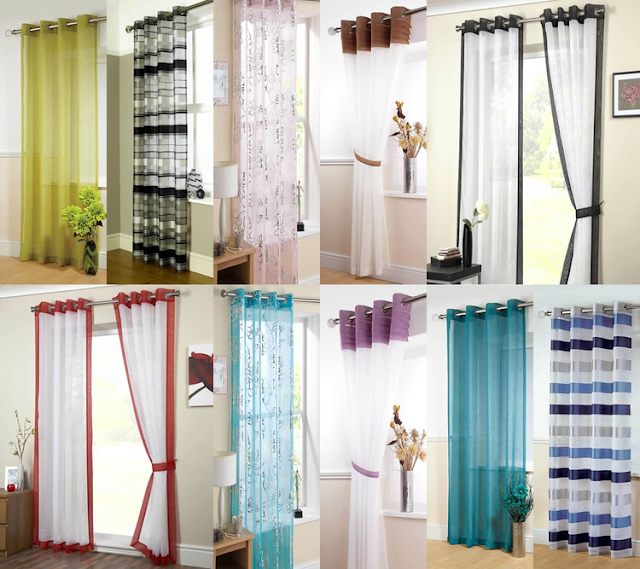 Two different colour curtains can give the room a whole new perspective and a modern look. Irrespective of the two panels used the material used for both the draperies need to be the same or say one should be thinner and lighter than the other, soft sheers paired with canvas or silk curtains. 1. Multiple Shades on Windows in the Same Room: Generally people tend to have a single shade of panel for the entire room, using multiple colours can give a diverse look for the room provided the entire colours are complimenting each other and the fabric used being the same. If the one set of windows are comparatively larger than the other windows then add more attractive shade to them to make it more prominent. 2. Decorate with a recurring design: Hang each panel, alternating the colours, on one rod to create a pattern. The curtain pocket or hanging mechanism for each panel needs to be the same -- choose hooks, rings or a sewn-in pocket at the top of each panel. Frame the window by keeping the darkest or heaviest-weighted panel on the outermost corners, and use an odd number of curtains so the ending color on each side is the same. 3. Layer the design: Double rod panels are required. Provided the darker shade at the back and lighter at the front. Allowing privacy requirements of covering the house. This look is most often done with a set of sheers and a set of heavier-weight curtains. However, it can work well with panels of the same material in different colors, with the lightest shade kept inside and the darker one in front. This can be done with either leaving the curtains to the frame or vintage style of tying the curtains up the side.